22 Jul 2015 in Public Engagement AyeWrite! Saltire Society Glasgow Literature Reading ~ read. On Tuesday the 21st of April, 2015, I was privileged to be part of an event at Glasgow's annual literary festival AyeWrite! Paul Docherty and Lauren Weiss, both fellow PhD students at the University of Stirling, organised a panel session, called 'City of Words', showcasing research on reading at the University of Stirling and the University of Glasgow. 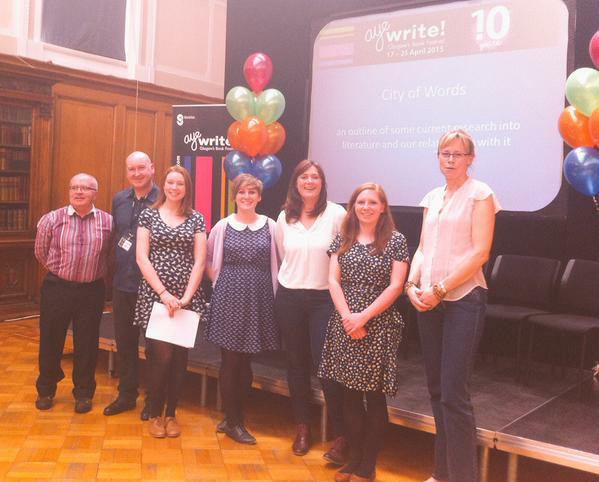 This was the first event of its kind to take place at AyeWrite! The aim was to engage the public with the wide variety of research taking place in the field of reading and literature in Scotland. Speaking for five minutes each on our PhD research, the panelists ranged across a wide variety of topics and historical periods. What was remarkable, however, were the intersections and interactions between, what at first appeared to be, very different, research topics. The first panel, titled 'Historic Reading/Not Reading' began with my own project which focuses on 18th-century Scottish children and the books they might have read. I drew parallels between this historical research and the anxieties surrounding children's literacy and access to different media today. Louise Creechan from the University of Glasgow discussed her work on 'Not Reading the Victorian Novel' which included a fascinating look at dyslexia in the Victorian period.This was followed by Lauren Weiss's discussion of her work on 'The Literary Clubs and Societies of Glasgow: A History of Scottish Reading, 1837-1901'. Lauren urged the public to get in touch as she is currently trying to find as much evidence as possible about what people in Glasgow were reading and what they might think about it. She urged them to rake through their attics for old family journals and notebooks which might offer some insights. If you think you have anything useful for her, you can contact her at the link above. The second panel session on 'Philosophy and Literature' featured Mauro di Lullo from the University of Stirling. He offered a whistle-stop tour of his research on Maurice Blanchot. The third and final panel featured research on the contemporary issue of 'Accessing Literature' with University of Stirling PhDs Paul Docherty, Stevie Marsden and Louisa Preston from The Centre for International Publishing and Communication. Paul's paper discussed his work with Glasgow Life which aims to develop a city-wide strategy for the promotion of reading, writing and publishing. Stevie gave us an overview of the History of The Saltire Society's Book Awards and Louisa looked at the role of the digital in cultural organisations and their engagement with audiences. What seemed to come out in the discussion and questions afterwards was the link between the more historical research and that which focuses on the present day. At first glance, it would appear that 18th or 19th century readers have little in common with today's app users but a lot of the societal anxieties about what constitutes appropriate reading behaviours are very similar across historical periods. The event was a great opportunity to speak to people outside of academia about our research and it was a privilege to be part of the fantastic AyeWrite! literary festival and I hope there'll be many more events like this at literary festivals across the country.